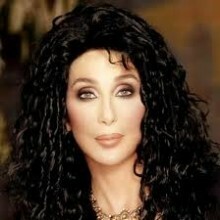 Cher (born Cherilyn Sarkisian; May 20, 1946) is an American recording artist, television personality, actress, director, record producer, and philanthropist. She began her career as a backup singer and came to prominence in 1965 as one-half of the pop rock duo Sonny & Cher with the success of their song "I Got You Babe". She subsequently established herself as a solo recording artist. US LP, custom stickered shrinkwrap "Featuring Living in a house divided"